Since the day I fell in love with radish, I have started getting them home and experimenting with them in various ways. I was looking out for radish with leaves. Most of the grocery stores in Bangalore only sell the radish by discarding the leaves. I was on a hunt for radish with leaves. One fine day I spotted radish with leaves with the guy who moves door-to-door selling veges in the morning. I was thrilled and grabbed some of those and made a tasty dish. 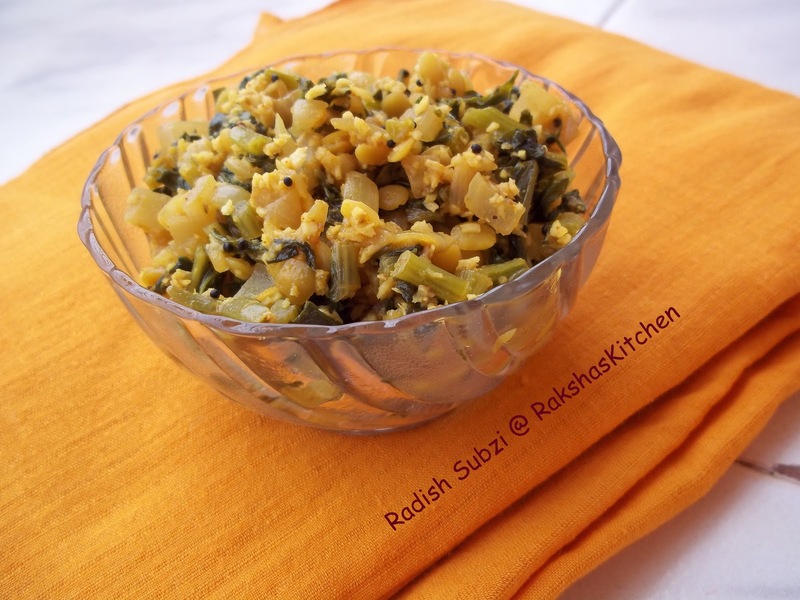 To know how I prepared the radish sabji with its leaves read below. Chop radish leaves and the tender stem. Peel radish. Cut radish into small pieces. In a kadai, heat oil. Add mustard seeds. When they splutter, add asafoetida and finely chopped onions. You can cover the kadai for 5 mins till onions turn pinkish. Now add toor dal and radish and add 1 cup water. Add the radish leaves and mix well. After it gets cooked, add coriander, turmeric and chilly powder. Stir properly. Add jaggery and coconut and mix well. This can be served with rice or chapatis or mooli paratha. Thanks for sending to a veggie/fruit a month! A simple & flavorful subzi!! Good one! Radish are so pretty to look at I love them. And you my dear are the sweetest 🙂 thanks for lovely words – Your mooli curry looks delicious- We usually only consider make mooli sambar or parathas, but this is a yummy way of making it – Lovely post!